A corporate party at the Hyatt Regency Baltimore? Or a private birthday celebration at the Tremont Plaza Hotel? If you've got an upcoming event or party scheduled for the Baltimore area, you'll be surprised to learn how easy it is to book a band, comedian, or celebrity to appear at your event. Providing all in one no-surprise price, Booking Entertainment has been assisting clients with full-service, turnkey events, including headlining entertainment, for sixteen years. Almost any band, comedian, or performer is available to help make your Baltimore area event a genuine success, and Booking Entertainment is ready to help you not only arrange for such an appearance, but also attend to the overwhelming details that go into such a production. These details include not only an onsite staff to produce the musical portion of the event, but also fees, flights, ground transportation, hotel accommodations, staging, sound, lights, backline equipment, per diems, and misc. rider requirements. Let's begin with the Entertainment Request Form. In filling it out, you will be able to provide us with the details of your upcoming Baltimore area event. You will hear from one of our agents within twenty-four hours, to chat with you about the process and see if you have any other questions. After selecting the appropriate entertainment, you'll be given a turnkey price by our agent, one that includes all the details mentioned above. At this point, you can choose to move forward and have the agent send the formal offer. 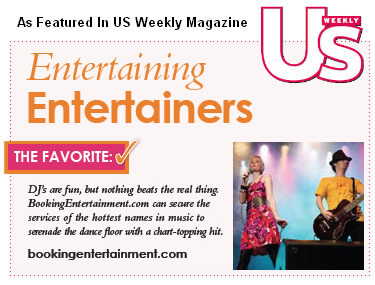 Booking Entertainment is delighted to take its sixteen years of experience in the business and use it to create an exciting experience for your Baltimore area event. And please email us with any other questions you might have. We are committed to working closely with you to ensure that your party or event exceeds your expectations.